Swinging doors are common conveniences in pantries and laundry rooms, and a push plate will protect surface of a swinging door from fingerprints, dirt and other damage. A push plate is a thin piece of metal that is attached to the edge of the door at arm height. It keeps wear and tear to the door surface at a minimum. Push plates can be strictly functional or decorative, and they are usually made of brass, iron or bronze. Hold the installation template that came with the push plate to the desired location on the door 3/4 inch from the door edge. The instructions that came with the push plate may have recommendations for a comfortable mounting height -- usually 45 inches from the bottom of the door to the center of the plate. Hold the push plate directly to the door if you do not have a template. Place a small level across the top and sides of the template or push plate to ensure it is straight. Mark the locations of the mounting screws through the holes in the template or the push plate with a pencil. Remove the template or push plate from the door. Place the point of an awl or a nail over each pencil mark and tap it with a hammer to make a small indentation for the self-tapping mounting screws. Drill shallow pilot holes on the marks with a 3/16-inch drill bit installed into a power drill if you will be attaching your push plate with regular wood screws. Place the push plate over the edge of the door. Line up the mounting holes in the plate with the indentations or holes you made previously. Drive the self-tapping screws through each mounting hole and into the door with a Phillips screwdriver until they are tight. Use a Phillips bit installed into a power drill to drive in the screws more easily, if desired. 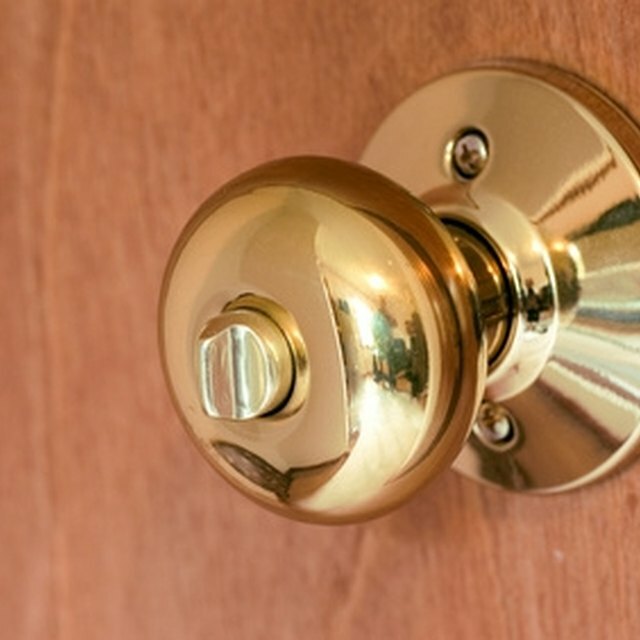 Although push plates are usually attached to wood doors, they can be secured to a metal door in much the same way. Drill through the pencil marks for the push plate mounting holes with a 3/16 inch drill bit installed in a power drill. Install the push plate as instructed previously.